Led by the Fijian Presidency, which included climate resilience in two of its six priorities for the conference, climate resilience was firmly on the action agenda at COP23 in Bonn in November. Announcements by Norway and the Lightsmith Group of new investments into climate resilience also demonstrated that concrete action on climate resilience is gaining momentum. 1. Unblocking investment into climate resilience. 2. Why climate resilience matters for people in SIDS and other vulnerable countries. 3. Working with nature to build climate resilient and sustainable development. Bringing together leaders from across government, business, communities and civil society to raise the ambition for action on climate resilience, these events formed the Global Climate Action Resilience Day and were convened by the UN Climate Resilience Initiative A2R and its Partners. Mary Robinson picked up the challenge set by Fiji saying “To build resilience effectively we must address the root causes of poverty, inequality and exclusion and put people at the centre of decision making”. Tasked with presenting solutions, participants at the roundtable on investment discussed how to increase investment, and not to shy away from being ambitious, going from billions to trillions of investment. Many highlighted the urgent need to simplify access to finance to ensure it reaches local communities. For example Filipe Nainoca of the Fiji Red Cross highlighted that the volunteers and the vulnerable communities they serve “often lack the very small amounts of money for critical high-value actions at the local level”. Norway announced a joint new USD 400 million fund with Unilever to invest in business models that combine investments in high productivity agriculture, smallholder inclusion and forest protection for more resilient socioeconomic development. The Lightsmith Group received commitments of USD 1.6 million from the Nordic Development Fund and the Global Environment Facility to support the launch of the first private investment fund focused on climate resilience.. This is the first public-private investment strategy for adaptation and climate resilience and was catalysed by the Global Innovation Lab for Climate Finance. The Resilience Day considered actions required across three key capacities for climate resilience: to anticipate climate risks and hazards, to absorb the impact of shocks and stresses and to reshape development pathways. Lessons learned and actions needed were highlighted across sectors. The Hon. 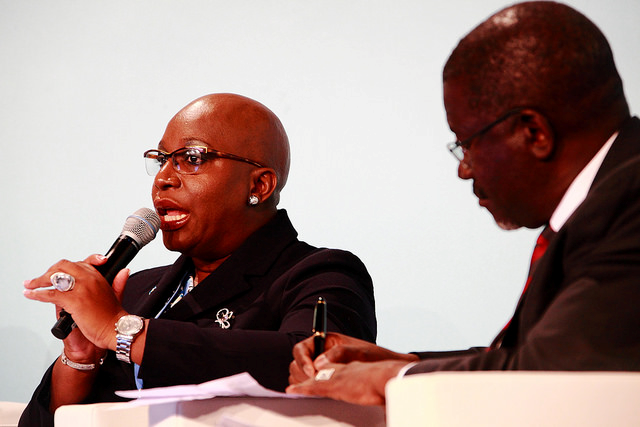 Minister Gale T. C. Rigobert of St. Lucia highlighted the experiences of rural women farmers in St Lucia who do not often qualify for loans, and the need to increase women’s access to finance in the agricultural sector threatened by climate risk. Talking about the importance of nature-based solutions, H.E. Tommy Remengesau, President of Palau, expressed that “by protecting nature you not only protect your own country but more regions of the world are benefitting from such investment”. H.E. Mrs. Lina Pohl, Minister of Environment, El Salvador highlighted that “the biggest challenge is to invest in nature, as not all understand the relation between economy and environment. Environment means economy and we have demonstrated that the constant economic loses were because of not working with nature, for not investing in nature, as investing in nature means to protect also the investments in grey infrastructure”. Dr. Bregje van Wesenbeeck, from Deltares stressed the importance of implementing contextualized, research-based solutions for nature conservation and restoration to build climate resilience. She made a call to work with nature-based solutions that even when more costly or less popular, on the long-term will provide bigger benefits for nature restoration. We now need to build on this momentum and address the challenges identified during the Resilience Day to meet the resilience-related ambitions of the Paris Agreement. This includes increasing investment, working with nature to build climate resilience, facilitating innovation and building new partnerships comprising governments, businesses, investors, international organizations, civil society and local stakeholders. To work together under the Talanoa Dialogue so that it includes a substantive discussion on resilience and actions on resilience have a strong people-centred approach. To strengthen understanding and knowledge of climate resilience and the transformations, innovations and solutions needed to build resilient communities, businesses and economies. To catalyse and help generate new public- private blended financing mechanisms, including appropriate and accountable insurance schemes that strengthen climate resilience as well as mechanisms that improve access to climate finance for local actors working with most at-risk communities. All images courtesy of the Red Cross Red Crescent Climate Centre.